No, not another in the butterfly series, you'll be pleased to hear. Eli wants to know about momentum in GCMs. Specifically, "how momentum is transferred from the Earth to the atmosphere as it rotates". Well as far as GCMs are concerned the rotation of the earth is a lower boundary condition and its fixed (in the real world variations in the atmospheres angular momentum, from exchanges with the earth, do cause tiny but detectable changes in the solid earth rotation rate. But these changes are so tiny that for GCM purposes they should be neglected). However in a GCM the atmosphere does exchange momentum fluxes with the earth (which affect the atmos if not the earth) and with the ocean (which *do* affect the ocean and are the main cause of the various oceanic currents). In the boundary layer above the earth (or ocean) the exchange is represented by Monin-Obukhov similarity theory which I won't go into (BL met is a thing in itself) but the momentum exchange is proportional to the near-surface windspeed, the roughness length of the underlying surface (which is a combination of the real roughness of the surface as you would measure it, enhanced to represent the form drag from orography below resolved scales if your model supports that), and a parameter, call it C, related to the stability of the atmosphere (very stable conditions (i.e. strong inversions) have little coupling of sfc to atmos and hence small C (theoretically, zero for very strong inversions). Unstable (convecting) atmos has lots of coupling and a large C. Above this there is some friction between the various atmospheric layers leading to momentum exchanges. As well as this there some other terms: the form drag of mountain ranges leads to more mom flux (up to half the total I think?). And Gravity Wave Drag which represents the effects of momentum transfer from surface orography to breaking gravity waves high up (300 hPa?). But quite apart from that, there is another interesting thing. My picture shows the near-surface (10m) winds from HadCM3 (it would look almost the same in the re-analyses, if you're silly enough not to trust GCMs...). BTW, I apologise for the lack of anything drawn on top of the positive colours: I've no idea why the IDL Z-buffer insists on this: any IDL gurus out there?). Its an annual mean - it would look somewhat different in different seasons. No matter. The contours are the zonal (EW) component and the horizontal wind arrows are drawn on top. 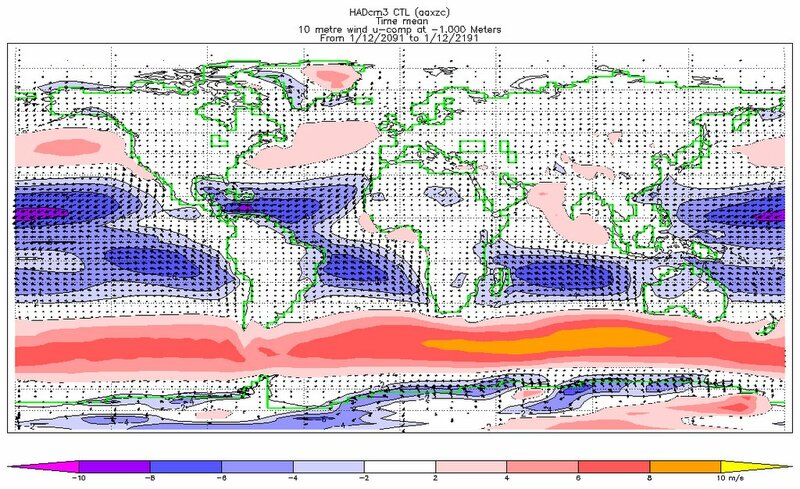 The most obvious feature (apart from the low speeds over the continents: they are much rougher than the oceans; and perhaps the strong southern ocean westerlies) is the tropical easterlies: this is an inescapable dynamical consequence of the earths rotation and the heating at the equator: air rises there, hence there must be equatorwards flow near the surface, hence (Coriolis) these winds are deflected towards the west; hence the band of easterlies from 30N to 30S. Now (supposing you believe in conservation of angular momentum) this necessarily implies average *westerlies* over the rest of the globe, since we know that on average the atmosphere is neither slowing down nor speeding up. 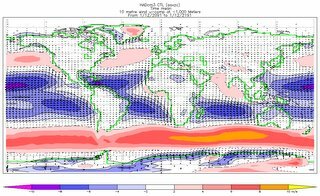 This then touches on does-the-ferrel-cell-exist kind of stuff: because although there are good dynamical reasons (so people tell me...) for the mid-latitude westerlies, the actual reasons behind them are quite complex. HI William, spotted the question mark with respect to gravity wave momentum deposition (not always a "drag"). Belette - I took a shot at part of the same question here.